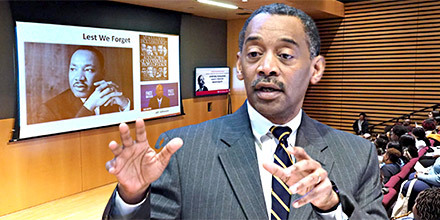 Jonathan Woodson, MD (above), the former top medical official in the U.S. Department of Defense, was the keynote speaker at the 2019 Martin Luther King, Jr., Health Equity Symposium presented by the University of Pennsylvania's Office of Inclusion & Diversity. The Military Health System (MHS) that Woodson ran for six years provides health care services to more than nine million active and retired military personnel and their families. The country- and globe-spanning network of health care delivery services and facilities on U.S. bases is an "equal access" system, or the military equivalent of universal health care. Woodson's presentation focused on recent studies conducted by the Murtha Cancer Center and the National Military Medical Center of various kinds of cancer care throughout the MHS system. He said the research found almost no disparities in access, treatment or outcomes between white and non-white patients -- a stark difference from the high levels of disparities in health care measures throughout the U.S. civilian health care system. "These findings have caused the Murtha Cancer Center to conclude that equal access to care for all persons, such as in the case of the Military Health System, is the key to maximizing positive, cancer-related outcomes in all patients regardless of ethnicity and race," said Woodson who is currently Director of the Institute for Health System Information & Policy at Boston University. He also holds joint appointments there as Professor of Surgery at the School of Medicine and Professor of Health Law, Policy, and Management at the School of Public Health. Opening the fifth annual MLK Health Equity event that filled Penn Medicine's Rubenstein Auditorium (above, left) was Chief Medical Officer Patrick Brennan, MD (above, right). "We are doing foundational work here at Penn Medicine in an effort to address inequities in health care," he said. Brennan noted that recently on NPR, James Earl Jones read Dr. King's 1963 Letter from Birmingham Jail. That missive was written in response to white clerics who were admonishing the Civil Rights Leader's nonviolent demonstrations. 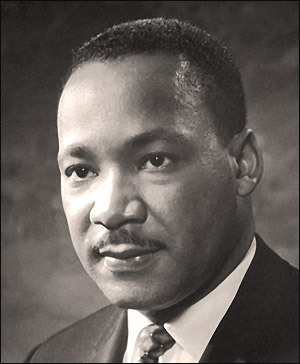 "In the letter," Brennan said, "Dr. King cited the centuries of patience in the face of injustice that had brought the civil rights movement to the point of civil disobedience. It was self evident that patience had been exhausted as a response, so we too should be impatient in our pursuit of health equity." "Many people think we've been hearing about 'population health' for maybe 50 years or so," said Penn Vice Dean for Inclusion and Diversity and LDI Senior Fellow Eve Higginbotham, SM, MD, (above, left). "But actually, this has only been a topic of discussion for about 20 years. Population health is the health outcomes of a group of individuals, including the distribution of such outcomes, within the group. Our colleagues at the Institute for Healthcare Improvement remind us that it's everything after the comma of that definition that we forget, including the distribution of such outcomes within the group. As a health system, if we only think about population health with one brush, we miss all the other populations; it's important for us to be mindful of all the issues that challenge so many of our communities." Above, right, Jaya Aysola, MD, DTMH, MPH, Executive Director of the Penn Medicine Center for Health Equity Advancement, Assistant Dean for Inclusion and Diversity, and LDI Senior Fellow, moderated the symposium's three person panel discussion on health equity issues. Panel member Roy Wade, Jr, MD, PhD, MPH, MSHP (above, left), is an authority in the field that was created two decades ago by the Adverse Childhood Experiences Study (ACES), a landmark research project that has been underway ever since. That ACES work documented how ten different kinds of childhood trauma can dramatically impact the long-term physical and emotional health of an individual throughout their entire life. "Children born to a mother who herself experienced abuse or neglect as a child are at increased risk for fetal death," Wade explained. "Kids exposed to adverse childhood experiences are at increased risk for things like developmental delay, behavioral problems or even cognitive impairment... Unfortunately, there are certain populations at higher risk for exposure to adverse childhood experiences and, thus, this may explain disparities in outcomes." Wade is an Assistant Professor of Pediatrics at Children's Hospital of Philadelphia (CHOP) and an LDI Senior Fellow. In a particularly poignant presentation, panelist Krisda Chaiyachati, MD, MPH, MSHP (above, right), told the audience that although it was not obvious from the way he looked, he grew up in the predominantly African American community of South DeKalb County in Atlanta. He was one of only five non-black students in his high school graduating class. "I came to today's symposium not thinking about living in the 'shadow' of Dr. King," he said, "Instead, I was thinking about the light he shined on inequities and our responsibility to try to correct those inequities." "The challenge that sits in this room with us as heavily as it sits on my heart is this: Two people, equal in every way but race or ethnic heritage, walk out of a hospital having been treated for the same exact disease. But one experiences worse quality of care or has a worse outcome," said Chaiyachati. "Why is that? How can policy makers more effectively respond to the inequity we're all observing in the world and within the clinic walls around us?" Chaiyachati is an Assistant Professor of Medicine at the Perelman School, an Innovation Manager at Penn Medicine's Center for Health Care Innovation, and an LDI Senior Fellow. "None of us can ignore the fact that we live in a world where we are surrounded by violence or that violence is definitely a health equity issue," said panelist Therese Richmond, PhD, CRNP, FAAN (above, middle). She is a Professor and Associate Dean for Research & Innovation at Penn's Nursing School, an LDI Senior Fellow, and an expert on the physical and psychological impact of violent injury on a patient's recovery and return to daily life. "The take home point of my presentation," Richmond continued, "is that from a violence perspective, something is broken but it's not the person. And if it's not the person, then we can step back and look at the structural, economic and social strategies to make life more equitable and decrease the risk for violence and the other issues it can drive that are so relevant to health." At a Chicago news conference in 1966, Martin Luther King Jr. called for government action to force doctors and hospitals to comply with the Civil Rights Act and desegregate their practices and admission policies. The Associated Press headline on the story was "King Berates Medical Care Given Negroes." He told reporters: "We are concerned about the constant use of federal funds to support this most notorious expression of segregation. Of all the forms of inequity, injustice in health is the most shocking and most inhumane because it often results in physical death."